**Edit: in my dazed state at 9am on the morning after the elections, I incorrectly titled the manufacturing figure as 'manual labour'. The Conservatives gradually winning over blue collar voters in England is nothing new - working class Conservatives have always existed. However, the rate at which working class voters are now seemingly traveling to the Conservatives it is certainly emerging as one of the stories of this local election contest - and will most likely be very prominent in the upcoming General Election in June. But as well as this, other indicators not just of social deprivation but social class are beginning to connect with Conservative Party swing. From the graph below we can see a steady upward relationship between Conservative Party swing (from 2013-2017) at the ward level in England and the percentage of workers in manufacturing (according to Census 2011 data). This is evidence of an ever-growing movement of working-class votes to Theresa May's Conservative Party. 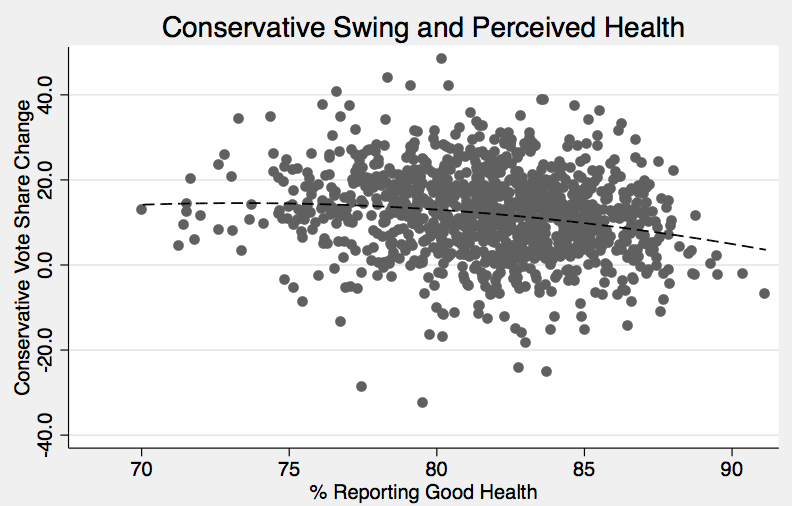 Additionally, deprivation also appears to play a role in increasing Conservative swing, with the % of people in each ward reporting to be in 'good health' (again according to Census 2011 data) relating negatively to Conservative Party vote share - in other words, when perceived health status is lower, so the swing to the Conservatives was higher. All of this points to one clear picture - a strong connection between social class and deprivation among voters, and Conservative Party swing. Put simply, the Conservative Party is hoovering up the 'left behind' voters, so many of whom flocked in their droves to UKIP just four years ago. However, this relationship doesn't hold north of Hardian's Wall. In fact, the opposite is true the other side of the border. 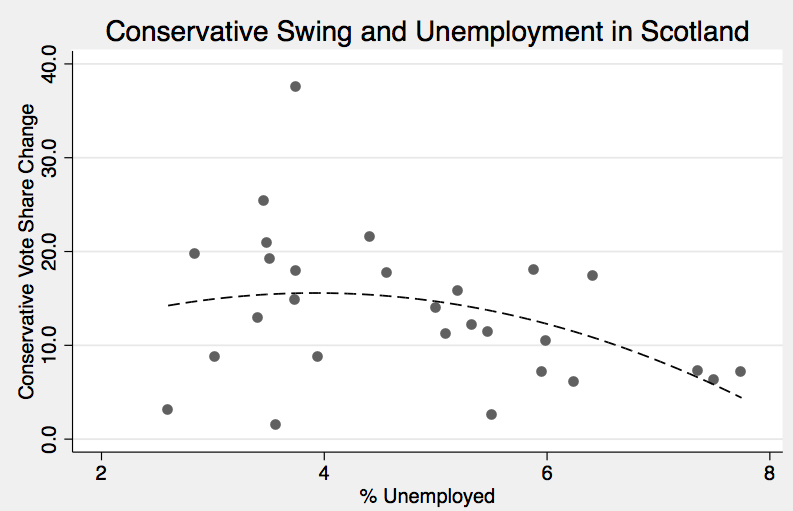 For instance, in Scotland the Conservatives actually attracted greater swings in areas with lower rates of unemployment (Census 2011). 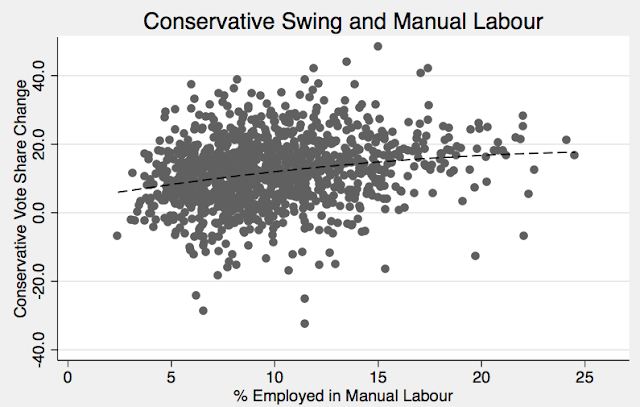 This suggests two divergent trends in Conservative Party voter swings between England and Scotland; while in the former, the party is increasingly attracting blue collar workers in more deprived areas, it appears that the majority of its support in the latter is coming from middle-class areas. In each nation, the Conservatives have clearly and purposefully situated themselves on one side of the dominant debates - independence (from the United Kingdom and from the European Union), and it is very much paying off. 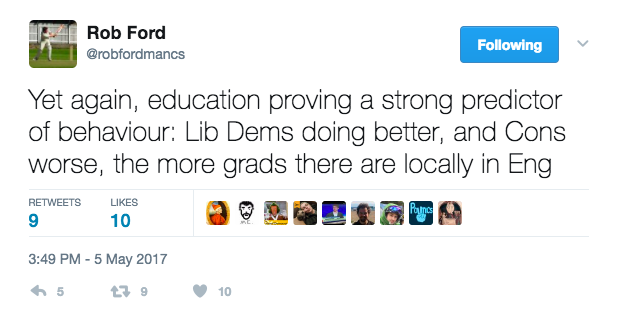 The Conservatives are making inroads in areas no one ever would have reasonably thought possible, and their increasing ability to attract swings from very much working class, blue collar areas in England, whilst simultaneously appealing to a more middle-class, pro-Union base in Scotland is the key to that.